Dining on a crewed charter yacht is like eating at a fine restaurant every day. Before your cruise even starts, we ask you to provide your personal gourmet chef with a detailed listing of your likes and dislikes, known food allergies, and special occasions to celebrate. She/he will call or e-mail you to discuss your food preferences and then design a menu tailored to your tastes. When you arrive, your yacht is fully stocked with your food, wine and beverage favorites and ready to go. Welcome aboard! Start your cruise with the yacht’s signature cocktail or the captain’s secret rum punch. If you love food and want a holiday menu created just for you by a trained chef then try booking a Luxury Private Yacht Vacation with Nicholson Yacht Charters & Services, the oldest and most trusted charter company in the Caribbean today. As a company, Nicholson Yacht Charters & Services has been in business since 1949 and was started by Rodney & Desmond Nicholson’s father, Vernon Nicholson, since 2001 Sarah and Afsaneh have taken the rains and now own and operate Nicholson Yacht Charters & Services, Antigua. Today we continue to offer all our valued clients unbiased and unrivaled customer service with an in depth knowledge of Yachts, Crew, Yacht Chartering in the Caribbean and worldwide. We have maintained the small size of the company and have turned it into a booming business giving unparalleled customer service. 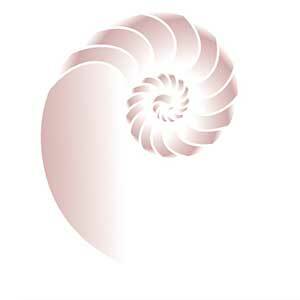 As a yacht charter Company, Nicholson Yacht Charter & Services has a lot to offer customers. If you are looking for special top quality cuisine on a yacht, Nicholson Yacht Charter & Services, may just have what you’re looking for. Getting good cuisine on a yacht is one of our top priorities, when booking a yacht charter with Nicholson Yacht Charter & Services. When customers book a private yacht charter, they are first asked what their food preferences are and what they like and dislike, we send each customer a fill in preference form to give us inside knowledge of what they want and don’t want to eat and the style of cuisine they most enjoy. Cuisine on a Nicholson yacht charter is tailored to each individual guest and chefs take into consideration any food allergies a customer may have. Chefs also ask if there are any special occasions you want to celebrate while on the charter… birthday, anniversary, graduation, reunion and are more than happy to create an EXTRA special mean for these occasions. Your personal chef will correspond with you by email and phone to discuss the menu plan and foods you would prefer to eat while you’re onboard. From this information your personal chef will provide you with luxurious yacht cuisine tailored just for you! Luxurious cuisine on a Nicholson Yacht Charter is easy to find with a menu that is tailored to customers’ specifications, including all the foods they enjoy. When you get aboard the charter yacht, you will find that the chef has catered a delicious menu just for you. 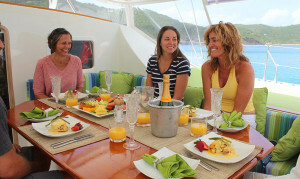 Aboard your private charter yacht, you will find all your favorite foods, wines and other beverages. If you’re looking for cuisine on a yacht that is both delicious and tailored to your taste, Nicholson Yacht Charters & Services is the perfect Company for you. Cuisine served on a Nicholson Charter Yacht rivals the best restaurants ashore but is even more delicious as it’s made just for you! 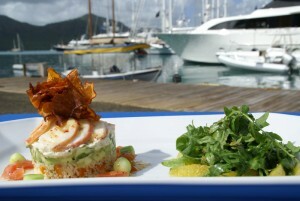 Cuisine on all the yachts we offer for charter has been tried and tested for quality, adaptability and flair. Whether you like classic cuisine, French, Italian, Sushi or Thai the chef will be able to accommodate you. And for the children there is really no problem as all chefs will be able to prepare healthy meals of whatever the children like under parents guidance. Of course there are always lots of new things to try, tropical fruits, local dishes and seafood, your chef onboard will offer you a variety of things to try and suggest alternatives. Lactose intolerant, gluten free, vegetarian or vegan, low carb diet, the chef and crew will be happy to cater for any dietary requirements. If you are looking for fine dining and great yacht charter services, then Nicholson Yacht Charters & Services may be just what you’re looking for.